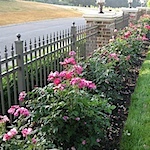 National Metal Industries carries a full line of top quality Metal Fence Systems. Each part of a Vanguard high-strength aluminum fence goes through an eight-stage process where it is cleaned, pretreated, powder coated and rigorously tested to ensure it meets the highest degree of quality. 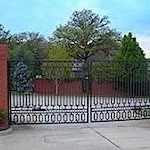 Color-Coated Pipe Gate Frames, Commercial Cantilever Gates, Commercial Roll Gates, Commercial Swing Gates, and Gate Frames. 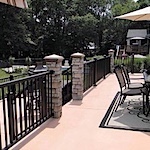 Aluminum railing for home, deck and porch.